I recently attended Worldcon 76 in San Jose, California, where I also gave a talk called "Le Guin's Daoism." I unfortunately had to leave before the Hugo Awards ceremony took place, although I was able to watch it online from home. Check out the results here (if you want a breakdown of the votes, see here). I heartily recommend watching the acceptance speech of N. K. Jemisin, who is as of Sunday a three-time winner of the Hugo for Best Novel! My Hugo ballot matches the results for Novel, Short Story, Dramatic Presentation (Short Form), Graphic Story, Professional Artist, Semiprozine, and Fanzine (I also got the Campbell Award right with Rebecca Roanhorse). Overall I was pretty pleased with the Hugo results this year. Luckily the whole Puppy thing seems to have blown over, or at least the Puppies took their yapping elsewhere. Either way, good riddance. My panel was really well attended and seemed to generate some interest (read the abstract of my talk here). I had a lot of fun with it. Thanks to the audience member who let me borrow his laptop in lieu of my sadly HDMI-less laptop! I apologize to the audience for having so much text on the slides. Someday maybe I'll learn how to make a proper PowerPoint (I'm probably too text-oriented and design-challenged to make good PowerPoints, but I can at least make them more accessible). 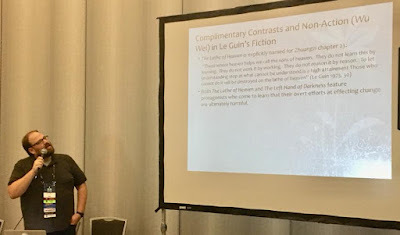 It was also great to meet my fellow panelist Heather Urbanski, who gave a great talk on Le Guin's The Lathe of Heaven. I met fellow philosopher and science fiction fan Eric Schwitzgebel in person for the first time! Check out Eric's awesome blog. And I went to one of his panels, where I met another philosopher and science fiction fan, Ina Roy-Faderman. I met a bunch of other people, many of whose names I may not remember. Sorry. I met someone who knows me from Google+ and this blog (Vicky Veritas), which was cool. I briefly met Regina Kanyu Wang and Neil Clarke. The latter is the editor-in-chief of Clarkesworld Magazine. I may have promised him I'd submit something someday, so I guess I'd better get on that. One of the other great things about Worldcon is that you see your favorite authors milling around like mere mortals. Right after I checked in, I saw Jo Walton and Ada Palmer just chilling at a table. I passed Greg Bear in the hallway, and saw others around like Saladin Ahmed, Sarah Gailey, John Scalzi, Robert J. Sawyer, Steven Barnes, and more. I didn't happen to see George R. R. Martin this time, but he was around. I went to my first Worldcon Koffeeklatch with Caroline Yaochim, who was a Hugo finalist for Short Story this year. It was pretty cool to meet with an author in a small group. I didn't realize I needed to bring my own coffee, though. I got to see some old friends at the con, some of whom took me to an amazing Cambodian place in San Jose. I also got to see some family and friends in the Bay Area outside of the con. I went to a lot of great panels: two(!) on Frankenstein, one on why people like horror, one on international fandom, one on depictions of libraries in SFF, a panel on writing workshops, another on ethical responsibilities to alien life, a really great talk by Steven Barnes on Afrofuturism, and one on 25 years of Babylon 5 (with my friend Cheryl Martin on the panel!). I got to hang out in the "Green Room" for program participants, which made me feel pretty cool and also had much-needed coffee. I should include one random thing: one of the convention center employees stopped me and asked me to explain a science fiction movie I liked and why he should watch it. I mentioned 2001: A Space Odyssey for an older one and Annihilation for a newer one. I don't think he was impressed, but it was a fun random moment. Of course there were parties! The party to promote Washington, DC as the site for the 2021 Worldcon was particularly good if memory serves. Since my red eye flight out of San Jose was delayed a bit, I was able to hang out in Callahan's (a lounge named after Guest of Honor Spider Robinson's most famous creation) and watch some of the Masquerade. I'm sure I did some other cool stuff, too! The next two Worldcons are slated for Dublin (2019) and New Zealand (2020), which both sound like amazing places for Worldcons. I've never been to either place, and I hope to rectify this terrible oversight. I guess I'd better start saving up my frequent flier miles and/or inventing a transporter!